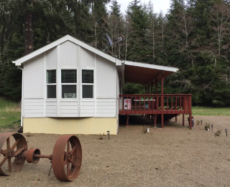 If you’re looking for cozy, comfortable and relaxed Forks, Washington lodging, then Blue Spruce Meadow is where you want to be. Our Washington Coast lodging truly gives guests the feel of home. This quiet little house is equipped with a yard, a campfire and a backdrop of the woods and fields. Elk are often right out your bedroom window. Everything you need is at your disposal, pots and pans, cooking utensils, a BBQ, you just need supplies.